Kimono-San was a great addition to our anime themed convention, Anime St. Louis. Our attendees enjoy panels on Japanese culture, and Bonita Harmon's knowledge and display of kimonos brought joy to them. She is a nice person who is incredibly great to work with. Kimono-San is always ready to add more to an event, be it her ability to do tarot card readings or anything related to Japanese history and culture. We recommend her services and look forward to working with her again. 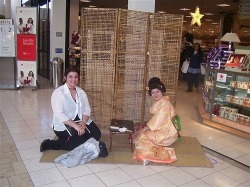 St. Louis' own kimono-san, also known as the Garden Geisha performed the ceremony for us. This was a very special experience that we shared together; one that I shall remember always. asking them back in the future. Our guest was really nice and polite. I enjoyed hearing her tell us about Japan. It was really nice that she let people touch and try one her stuff. She actually modeled and wore real kimono. The kimono are vary pretty.I learned so many facts and things about Japan and Japanese things, Like how thay where platform shoes called geta. I really enjoyed meeting her and seeing all of her things. Bonita performed at a cosmetic event for us. She was vary professional to work with. Her performance added something truly unique to our event.The customers definitely enjoyed her!